Build multiplication towers, using whatever building materials are handy. First, collect your materials. We’ve seen these towers built with wooden blocks, LEGO bricks, Minecraft, 3D printing, and beads. Next, prepare a square grid. Again, use whatever is handy - LEGO boards, chess boards, dowels secured in a shoebox, or good ol’ paper. Now, start building the towers. Let’s start with the first row. First cell of the first row will have one block or bead of color A. Second cell - two blocks or beads of the same color. Third cell of the first row - three blocks or beads of the same color A. And so on. Let’s start the second row now. First cell of the second row will have one Color A block and one Color B block. The second cell - two Color A blocks and two color B blocks. The third cell of the second row will have three Color A blocks and three color B blocks. Or beads, of course. In the third row, each cell will have blocks of three different colors. And so on. The process is rather contemplative. If done on a circular grid, it might even feel like making a mandala. One of the best ways to get children interested in a project is to ask for their help. But this help must be meaningful. You might tell your child that you will be making a sculpture, but would like her assistance with choosing materials and colors. Take turns building the towers. Or invite your toddler to help you place pieces on the towers you build. Once you finish a row, place a game where you switch two towers places. Will your toddler notice that something is out of order and fix it? Ask your child to build a tower that should go into the next column. How about the one for the next row? Rows and columns will require different reasoning. Once you put a few towers on the board, make one off the board and ask your child to find a cell for this tower. Or play in reverse - choose an empty cell somewhere in the middle of the board and challenge your child to build a tower that should go there. This is a process of building a 3D model of the multiplication tables. Once you build multiplication towers, use your fingers or a small action figure to “walk” up and down the structure. The outermost staircase goes up one by one, the next two by two, and so on - explore all the slopes! In calculus terms, these slopes are derivatives of functions y=x, y=2x, y=3x… which are 1, 2, 3… But the slope of the square-numbers diagonal (1*1, 2*2, 3*3...) changes from step to step. If you build the structure out of bricks or blocks, you can count them to find the volume. This models the process of integration. My child is very intuitive when it comes to math. Presented with a problem, she just leaps to the answer, usually the right one. When I ask her to explain how she got to the answer, she gets frustrated. And when I try to explain the solution to her, she gets impatient. A way to deal with an intuitive child’s frustration is to switch roles. Invite your daughter to teach you. If she just leaps to the answer, it means the two of you need to up the difficulty level, or the depth of your math. Offer the child to give you problems, or at least to take turns. Ask for pictures, stories, re-enactments with toys, and other ways your child can share the process of thinking. Maybe you can learn to follow the leaps of intuition. Don’t ask questions if you know answers. Some intuitive kids love maker tasks or scavenger hunts. Instead of "What is 3x4?" have a more open task, such as, "Let us make a model that shows 3x4." It's easier to discuss and to debug a model than to talk about a closed-ended question. Multiplication towers are beautiful! If you’d like to see what others have done with them, check out our online collection. But here’s something even more fun - build another set of towers, only this time change the rules a bit. In the original tower build (by the way, take a picture of it before taking it apart), the column number told you how many elements of each color to use while the row number told you how many colors to use. For example, a cell on the intersection of 2nd row and 3rd column would have elements of two different colors, three elements per color. Now, flip the rules. The column number will now tell you how many colors to use and the row number will tell you how many elements of each color. So the same cell on the the intersection of 2nd row and 3rd column will now have elements of 3 colors, two elements per color. One of the properties of multiplication that we learn is its commutativity: 2x3=3x2. Building this second, slightly modified, tower set will help you investigate this property. Take a picture of the new towers and compare the two. How are they the same? How are they different? How about building multiplication towers over these round times tables? We have not seen any yet, but it might be interesting to try! Surface, volume, slope, derivative, difference. Playing with the commutative property of multiplication can be a lot of fun. Join us and add your examples to our “What would you rather have” game. Would you rather have 1 cake with 8 candles or 8 cakes with 1 candle? Would you rather teach a 1 class to 20 students or 20 classes to 1 student? Would you rather get 100% on 1 test or 1% on 100 tests? Join the fun with your own funky examples that seem to put the commutative property onto its head! The property would not mind: after all, it is, well, commutative. We made a bead tower very like the one in the picture. While I was preparing the activity I figured out why I could never quite make sense of the version you have - the repeated facts (2x4 and 4x2 for example) are altered to be both the same which makes the model satisfyingly symmetrical (so there are two 2x4s but no 4x2s). But it means there is no consistent rule, which is why I was confused! I was so pleased to work this out. I would love to come back to this activity again using different materials. We made a chart and then built with duplos. We made a six by six table from play dough, pipe cleaners and some sort of fruity cereal rings from trader joes (thank you to whoever posted that idea!!!). The pipe cleaners had trouble staying up, but we got the idea. The kids loved this project, though possibly mostly due to the fact that they got to sample the cereal after (they'd never had it before, lol). @Eogruen, sounds fun and looks beautiful! I wonder if you can't suspend this table from something, maybe inside a cardboard box, the way @sherylmorris did with Montessori beads. My son used these Qubic pieces to create a multiplication table. When he ran out he used some Lego pieces. When those ran out he used pen and paper. The funny thing is how he's starting to blurt out multiplication patterns that he sees as we're driving around or at the store. Once you start seeing patterns... you can't un-see them, and they are everywhere!!! Your son looks so happy here. We used Legos for this. I tried it with one child in a flat version. He tried to mimic the shape but did not use the correct number of each color. I will need to try a different approach with him. I used actual towers with the other child. First we took turns working with just one color and putting 1, 2,3 blocks on each row. Then we worked together to do a tower with one of each color, two of each color and so on. She caught on to the pattern pretty easily. As we started on tower four she commented, "It gets bigger faster!" Yay! I haven't peeked ahead, but it seems that this would make a lovely calculus visual if you simply changed the reiteration with each tower as well. If you had enough blocks to do sets of towers you could visualize the changing slopes. We made a multiplication tower today using wooden blocks- we ran out a few but preferred it blank to filled in differently. I emailed you pictures, Maria, because it said they were too big to put here. We built a tower with minecraft also- that is when my daughter got it and stopped rolling her eyes. She finished building it and said, oh, it's just like this- pointing to the written times tables chart we had been filling out that was hanging on the refrigerator. Yay! @corilewis - thanks for the pictures! Here they are. We tried to build a multiplication table from 2x2 Legos. We only had enough to make it up to the 5x3 tower. It was very confusing at first. My 14 year old did not get it. He did not understand when to change colors. He also said "It's hard. I do not understand all the colors are different and no one did it the same way." We were looking at some of the other samples. My 11 year old who uses manipulatives when doing math says "It's the multiplication table 1x1 and 2x2." Then he said "It's steps" We had a really hard time getting it started and we even had to get the multiplication chart out so my older son could see it. We are going to work on this some more and see what we can come up with. @Court, do you think it would help to figure out colors by playing with the activity yourself, without kids? How about reading more descriptions about the color aspect? There is a pretty detailed discussion of reasoning behind colors at the Math in Your Feet blog. I could not get my photo to upload, because it kept saying the file was too large. We did a multiplication tower out of legos, because that was the only material we had readily available with enough pieces of the same size. Even so, in trying to keep the colors organized, we realized how quickly we ran short! We could only get our table to 6x5 if we were going to assign a certain color to each number. We decided to make an addition table as well to compare the two. The addition table slowly plodded upward while the multiplication table soared quickly to the sky. We asked several questions, like "which one is sturdier?" "which one would grow as tall as a tree the fastest?" "which one would make a better skyscraper?" One of the most interesting realizations was that the addition table was nice and symmetric, forming a diamond face. The multiplication table was not symmetric. At first I thought we had done something wrong, but no, that's just how it grows. There is a lot to think about there. It took longer than I expected. All morning. It was nice, quiet, relaxing work. My daughter stayed really focused, my son started building other things... Overall, we enjoyed looking at the finished product and figuring out how it showed multiplication. The living room was a disaster of legos and we lost track of time... evidence of good work going on :). cjmarchis, would you email your large pictures to moby@moebiusnoodles.com (just reply to any daily email with them)? I'll make them smaller and append them here. Comparisons are interesting - with addition towers, etc. When "building other things" happens nearby, they are often subtly inspired by new math patterns. Neat towers! I am not sure why the site complained about the sizes: they came to me small. Maybe Gmail resized them en route. Anyway, here is the math goodness, including some bonus Chaos Theory! Here is our Minecraft Multiplication Tower! My daughter had a great time making it, and had fun discovering its connection to multiplication. My son built one as well (or started to - it was so huge, I think he ran out of room), and immediately started noticing patterns in the different levels. I did this with my maths circle a few weeks back - the kids found it to be a really intuitive way to build up times tables. They were really disappointed when we ran out of room on the skewers. As we were using breakfast cereal, they also enjoyed some cereal kebabs afterwards! Good idea to do the chunks of different colors. Small kids just learning to count could easily help by assembling those chunks into little piles and then slide them on, where legos or computer programing might be too hard for them. So much to see at this course site, so many links to explore and I've been trying to channel Maria Montessori (ha!) Maybe this tower with Montessori beads has been done before; if so, let me know! Any other Montessorians in this mix? I like this tower because you can see the exponential growth. The commutative idea is less apparent because of the varying joining links. Does that make sense? Interesting observation about spacers (joining links) - they stretch out lines made out of multiple colors. It's the example of "What would you rather have?" - 10 beads on 1 wire, vs. 1 bead on 10 wires, not the same! Thinking outside the box (or blocks in this case), we tried music again. Number of octaves along the horizontal axes, and number of notes of the scale in the vertical axis. It looks kinda boring on the page, but is fun to try and play on the piano. I'm sure it would be more fun for a group of children to collaborate to get all the necessary notes played at the same time — I had to get by with using pedal, and playing the notes one at a time where ten fingers aren't enough. I love this idea - I can see a whole room of kids with keyboards or boomwhackers. I shared it with my husband, who is a musician (I am not much of one) and he also liked it. Both of your answers using music are beautiful illustrations about how people are always saying that music teaches math, but yours takes it to a new level. People often don't take the music-and-math beyond fractions and basic rhythm. We used Lego, like @dnamkrane's great work below. After failing to find her Mega Blocks in the shed, and finding Minecraft a bit too advanced, we used the free Lego Digital Designer to do the building. On the down side it was too complex for her to use, but she soon got the concept of what we were doing as we added new rows, and was counting the numbers out as we went. The best feature of doing it this way was the unlimited number of bricks, covering a wide range of colors, that we had at our disposal - we used over 1500 bricks. Also we were able to copy each row, so that each new row only needed the extra layer of bricks to be added. We were most interested in finding out more about multiplication circles. Doing a youtube search we found this: . I had never seen this method before. My son was very impressed but immediately claimed his way was easier... That lead to discussions on what other shapes are out there for multiplication. We learned that the multiplication chart he knew was also called a multiplication square or magic multiplication square. Some programs use triangles to teach fact families (http://www.newmanagement.com/downloads/triangle_te... And the coolest looking we found were the robin sunne multiplication clocks which is what the round tables or multiplication circle is also called & is the name for the circle above. My son loved it and he thought it made sense for 1's and 5's because when the minute hand is pointing to the 6 you times it by 5 to get the number of minutes. http://rootsandwingskc.smfforfree3.com/index.php?t... has directions and give the credit to Robin Sunne but the original website doesn't work. Shaped multiplication - great idea! I need to think more about it. I added Robin Sunne credit to the task description. What was the video your wanted to link? https://www.youtube.com/watch?v=mXLzLhfJgxM is the link for the youtube video we found that appears to not stayed in my original post... It is of a waldorf method of learning multiplication. Saw these Waldorf "shape multiplications." Found them interesting. Don't know if I'd understand completely the answer you might have, but, I wonder why the connection between specific shapes to specific number multiples. I honestly don't know. I was completely fascinated by it when we started researching. I can understand the idea of triangles for math facts/families when only trying to memorize the 3 numbers that go together & the reciprocity of addition with subtraction & multiplication with division. But the Waldorf videos & circles and other shapes totally floored me. I never had seen it done this way or explained before. I wish understand more on them too. We did this last night with legos, and the kids were sort of interested but mostly I got into it! Now it's being played with - I only went up to 5 x 6. But since I made that little one, both kids (4 and 8) could get the pictures of the big ones better. My artist daughter likes the idea of the spiral. Have to play with that! What I liked about it as a teacher is that it really brings home quantity and exponential growth, where just the numerals written on paper do not in the same way. It also drove home the value of multiplication over adding and counting individually, because I got tired of counting each tower from the blocks up and did it in chunks, essentially skip counting. Or I noticed the relationships among them, like 4x6 is one block shorter than the nearby 5x5. Will definitely use this in a future math class! 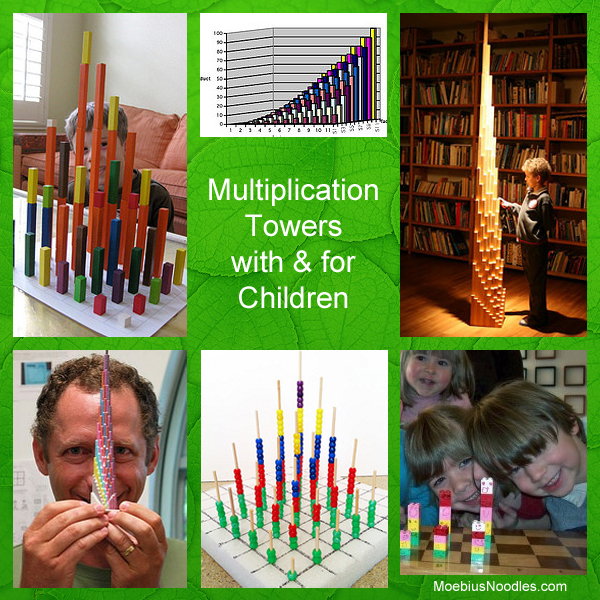 I'll be using your detailed explanation of why multiplication towers are "very multiplicative" structures. Even youngest kids, even toddlers, get that "skip counting by whole LEGO towers" idea. The other day, I invited several kids 4-6 to measure with rulers - they all got different answers; but measuring in LEGO towers, they all had towers of the same length (and were able to count the number of blocks reliably). We did this with Lego squares; not as easy as it sounds as we didn't have enough squares, and after the first three rows I gave up organizing by color. However, one of my sons did figure out a system using gradations of light, medium and dark to get nine different categories of colors. We used an array of five rows with five cells. Some patterns were easy to spot, and I asked them questions like how many cells have 4 or 12 legos, and where are they? I think that'll be an excellent way for my hands-on learners to start "seeing" multiplication, and I'll try to get them to write them down this weekend. I used Legos "squares" and spent an hour and a half putting it together because we didn't have that many squares. I did an array (?) of five rows with five cells, and for the first three cells we went by light, medium and dark colors. 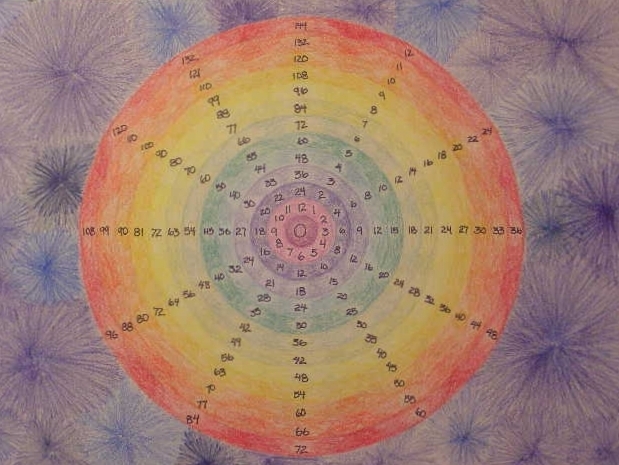 I asked how we could divide it up for the fourth row, and they were stumped until one of them came up with light-light, light-medium, light-dark, medium-light, medium-medium, medium-dark, dark-light, dark-medium and dark-dark, and he recognized that he'd created nine possible color categories. However, that wasn't going to work, so I just had them tell me how many needed to go in each cell from there on in. Started seeing some patterns and I asked them some questions, such as which cells have 12 or 4 or what not? I think I'll make them write those down this weekend, but we had a long, overstimulated day. Great tool though! What a fun (and beautiful) assignment! My 7yo daughter and I made a set of 5x5 towers this morning. I knew we didn't have enough legos (or I the fortitude) to make a 10x10 so I didn't give her the option! One question she asked during the process was: "If the second row is twice as tall as the first row, is the third row twice as tall as the second?" Obviously, she's still thinking of exponential growth and fractals. Once finished, she observed the identical slopes going either vertically or horizontally along our grid, and saw how going up the diagonal of squares was the steepest slope. I am now just realizing that the slopes along any of the vertical and horizontal gridlines are all lines with constant slope while the diagonal slope is parabolic. We compared the towers with the same height (i.e. 3x5 and 5x3) and talked about the commutative law. She asked, "When do I use the associative and distributive laws?" I wasn't ready for that one, so just came up with a pretty lame pen and paper explanation. Our photo has a bonus fractal tree at the base of the towers. Would LOVE to see someone build some towers using the circular multiplication table, but before you do, you might want to invert the numbers so the larger numbers are on the inside rather than the outside of the circle.